Sometimes through circumstance, the storeroom contains one or two gems which have only been viewed a couple of times. 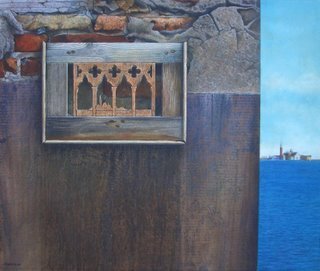 This piece, "In the Stones of Venice" was originally painted and shown in the Singer friedlander watercolour exhibition. When it returned I had it in the Queens Gallery for a couple of weeks then buried it in the store. I thought I would let you have a look as its feeling neglected (but alas not alone). “In the Stones of Venice”, alludes to my feeling that the passing of time is conveyed by the surface history contained within an object, much in the way an old person is said to have their past written on their face. In this painting I have hidden within the lower part of the wall, a map of Venice, which can be seen glinting from the surface like a vein of gold. The history of Venice is very much contained within her buildings and it was this, above all else, that impressed me the most about this unique city. So much so that I felt I needed to communicate this through my work. The title also alludes to John Ruskin’s, “The stones of Venice”, where he spent long months working in Venice until he had reduced its beauties to “mouldings and mud”. My studies of Venice have reduced her to surface texture and ambiguity.